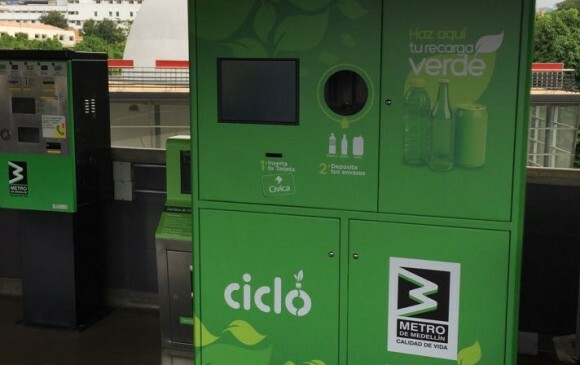 Engineers in Medellin, Colombia, have developed a machine that exchanges tin, glass and plastic bottles for credit that can be used in Medellin's overground system 'Metro de Medellin'. This is a pilot project that the Metro of Medellín will put into operation in conjunction with the company Paisa Ciclo. Where does the machine come from? This is a reverse vending machine (RVM) designed and built in Medellín by Ciclo, a company that was born as a thesis project of two engineers of the School of Engineering of Antioquia. Today we are five engineers (two mechatronics and three managers) that built machines created with systems that are different from what there was in the market. The company has already won awards such as the Capital Semilla competition and the TIC Americas international competition. How did they get to collaborate with the Metro? We seeked to start conversations with them, but as Metro is a public entity, they had to implement legal tenders and public calls, which we won with our machine. Getting to the metro is an achievement to start our project, is an option that we arrived to with effort and much work. The machine receives containers and exchanges them by credit that is immediately reflected in the Civic Card (ticketing system used by Metro de Medellin). The machine does not have a limit per transaction, not per user nor per day. That is, in each transaction the user can change from a bottle - glass, plastic, tin - that will give 50 pesos balance, up to 2,000 pesos. 40 bottles will give users enough credit for a single train ticket. That cap is going to expand up to 5,000 pesos, equivalent to more or less 110 bottles. Is there a size limit for bottles? Yes. Receive up to 3 liter bottles. The benefit (credit) may also be higher depending on the size of the bottle. Users simply arrive at the machine, introduce their Civic Card, then the bottles, and finally the machine gives him the option to change the bottles for credit. They can also donate them. If you donate them, they go to the company and if you exchange them for credit, the machine tells you how much balance you won and how much you have left (if you had funds on the Card). Is there any condition for the machine to accept or refuse the bottles? The bottles are received anyway: with label, with lid, without lid. But you do have to keep the shape of the container: It must not be very wrinkled and be empty. They do not have to be completely washed, but they have to be dry. What about those bottles later? They are commercialized. In the future we have a plan that also involves a cooperative of recyclers. Could this type of machine be applied in another transport system? Yes. In fact we have many more benefit models that are being implemented.